Sport horses have a different nutrition requirement than horses for recreational purposes. During training and competitions, the body asks for more energy. This energy comes from grain, seed oil and fiber. Sport horses who perform a peak performance in the race need a varied range of starch, sugar and fatty acids. With the short muscle burden, the energy needs to be released quickly to make the horse perform well during the jumping course or, for example, an Icelandic land during a course test. The Energy ClassicEnergy Classic is a grain mix with high energy value and high vitamins. The energy-enhancing muesli based on different grains such as oats also contains extra vit. E, Selenium and natural antioxidants for quick recovery after work. In the case of a heavy performance, more horse endurance is required. This can be supported by food with a higher content of fatty acids such as linseed (oil). Nowadays, many temperamental jump and dressage horses are released in the sport. These horses quickly suffer from stress and / or nervousness. Low starch feeds and high levels of fatty acids and fibers help the horse to distribute energy over the duration of its performance in a better manner. Fatty acids give a lot of energy without the horse becoming hot or nervous. The Hartog Energy Special sports muesli complies with these conditions and also contains an increased content of magnesium and tryptophan. This combination allows muscles to relax faster and helps minimize nervousness. 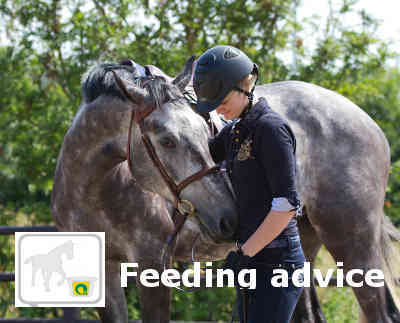 The need for good digestible protein, vitamins and minerals is higher for a sports horse than for a recreational horse. By the stress and development of the muscles that a sports horse goes through, a it needs these nutrients to restore and strengthen the muscle cells. A constant and high-quality ration is therefore recommended. Increase the quality of the ration with Hartog Lucerne-mix, Gras-mix or Lucerne-mix Digest. These fiber rich feeds are a healthy source of protein. Mixing the Hartog Lucerne-mix with the concentrate slows down the intestinal passage. This results in a higher uptake of nutrients from the feed ration and improved intestinal activity.